Definisi dari preposition of place adalah kata depan yang digunakan untuk menunjukkan tempat atau letak subjek/benda dan diikuti objek/benda lain yang dapat menjelaskan sesuatu. Contoh : Your ball is under the chair. Toni hangs the picture over the table. Over three year, he becomes more diligent. In : Menunjukkan posisi benda di dalam suatu tempat atau ruang. 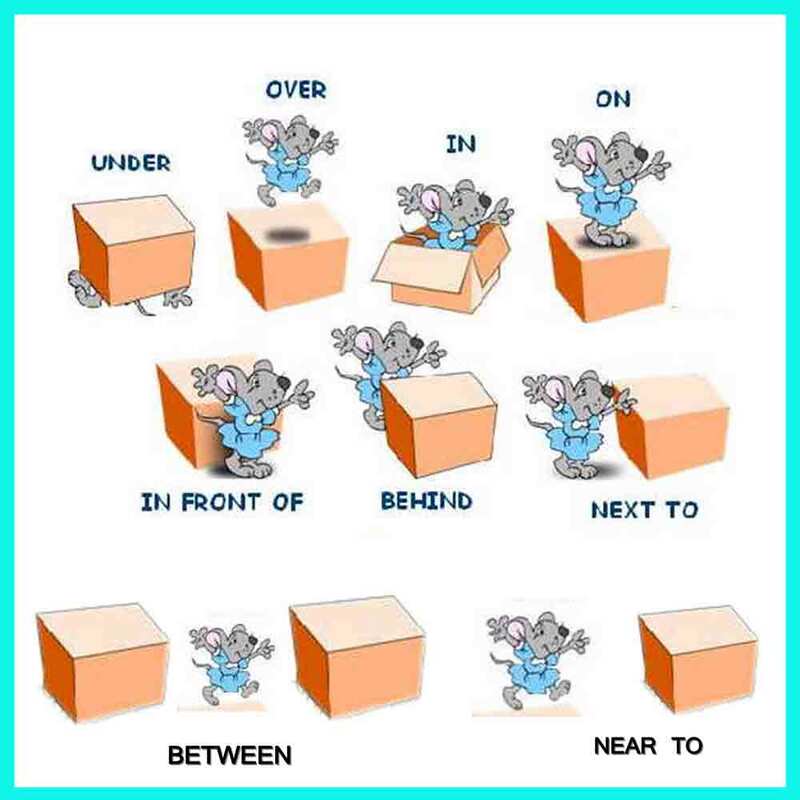 Contoh : The mouse is in the box. On : Menunjukkan posisi benda di atas benda yang memiliki permukaan. Behind : Menunjukkan posisi benda berada di belakang benda lain. Contoh : The motor cicle is behind the bus. Next to/ beside : Menunjukkan posisi benda berada di samping atau di sebelah. Contoh : She is standing next to her new car. Between : Menunjukkan posisi benda diantara dua benda/lebih. Contoh : I sit between Afis and Kevin. Near to : Menunjukkan posisi benda dekat yang memiliki jarak. Contoh : He looking for a apartment near to his office. Contoh : Sign your name at the top/ bottom. Contoh : Turn left at the traffic lights/ round about/ end of the street. Contoh : He stands to wait at the traffic light/ corner/ tree. Contoh : I wrote my name at the front/ back of the book. Contoh : What happened at the beginning/ end of the film ? Contoh : I saw him at a party/ conference/ football match. Contoh : I’ll meet you at the airport/ the station/ home. Contoh : We live in Indonesia. Contoh : I live in Kediri. Contoh : Mr Nuril lives in Kandangan. Contoh : It’s the highest building in the world. Contoh : They have a cottage in the mountains. Contoh : He has villa in a valley. Contoh : She works in a bank. Contoh : Don’t swim in the sea ! Don’t throw rubbish in the river ! Don’t take a bath in the lake ! Contoh : He lives in the middle of Paris. Contoh : Dona stays in the city centre. Contoh : I find information in the book. Contoh : The actor acts in romantic film. Contoh : I read about it in the newspaper. Contoh : She hung the picture on the ceiling/the wall/the door. He puts his shoes on the floor. Contoh : There’s a dirty mark on the page/ table. Contoh : There’s a label in on the left. Contoh : My office is on the second floor. Contoh : What’s on the menu? Did you buy everything on the list ? Contoh : I live on Kawi street. The nearest gas station is on the motorway. The post box is on the way to work. She lives on the coast. 1. He studies on the first floor. 2. He works in the city centre. 3. He lives in Park street. 4. There are no vegetarian meals on the menu. 5. The picture is on the wall. 6. The prince died at the end of the film. 7. Turn right at the end of this street. 8. There’s something written on the side of the box. 9. Jerry is standing at the back of the queve. 10. Your name is at the top of the list. 11. I live next to a railway line. 12. Your wallet is right in front of you. 13. We rented a car in Surabaya. 14. I met Helena at the butcher’s today. 15. I met Helena in the butcher’s today. 16. The school is on town square. 17. Sorry I missedd you. I was at a meeting. 18. Can you sign your name at the bottom please ! 19. 20. She lives in a farm in the montains. The office is on the main road between hotel and departement store. Demikianlah Penjelasan Preposition of Place dan Contoh Kalimat yang bisa saya bagikan.